Georgia is rightly called one of the first cradles of the world’s wine and wine culture. First evidence of this is that there are 8000 year old remains of cultivated vine, found by archaeologists in Georgia. In total in Georgia there are about 500 unique species of vine which is an unprecedented number for such a small country. 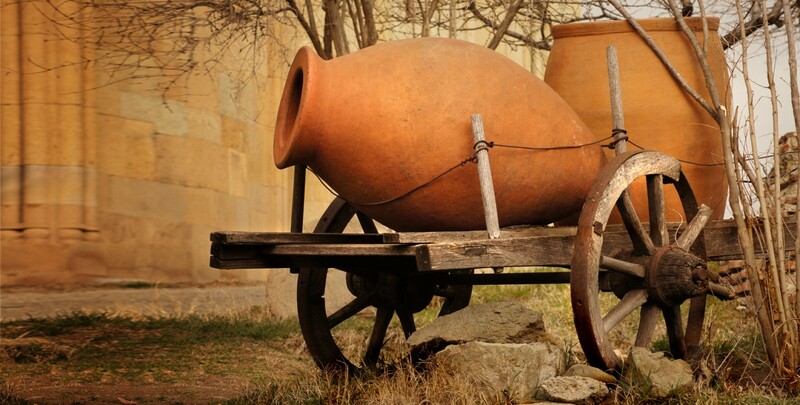 Local wine production technology is fundamentally different from European and includes fermenting juice with dehydration in clay amphorae – kvevri. Many varieties of Georgian wines, such as Rkatsiteli, Saperavi, Kindzmarauli, Mukuzani (wine), Ojaleshi, Hvanchkara (wine) and others conquered many countries. Wine is an integral part of the Georgian feast, be it a wedding, a national celebration or just a friendly meeting. One of the brightest traditions of the Georgian table is the choosing of an experienced and eloquent Tamada – Toastmaster of the feast who toasts and supports a good mood and order.